Was it good value for money? Hard to say ... 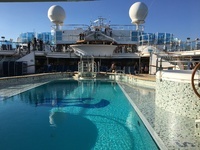 The itinerary was great and we were very luck to get hot, calm weather between LA and Honolulu. However, landing in Honolulu on Christmas day isn&apos;t ideal. Shops were only open in Waikiki, so it was overflowing with tourists. That said, it was probably our best day, due to the vibrancy. We walked around Diamond Head, swam at Waikiki Beach, shopped and had a drink and dinner on the balcony at the Hard Rock Cafe before heading back to the ship. The food was terrible. We&apos;ve cruised with Princess before, so this was no surprise. Vegetarian choice limited to one dish (often slimy eggplant), on the evening menu, so we mostly ate in the buffet. And I still don&apos;t understand why you can&apos;t get a cheese sandwich until 3:30pm! Every cake looked the same. After trying a couple, I avoided them for the rest of the cruise. Peanut butter cookies were pretty good though. If you really wanted nice food, you needed to pay $29 pp per meal to eat in the Crown Grill. Our friends raved about it but those costs added up over 16 days. With no vegetarian items on the menu, we missed out on the really good stuff. 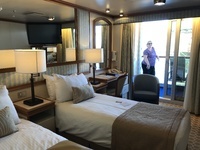 There were a lot of return guests on the ship, with many saying they wouldn&apos;t do the cruise again, due to the quality of the food and entertainment. One woman had done 42 with Princess and told them this would be her last. Most of the staff were fantastic and worked amazingly hard but we did notice a few with attitude (not in a good way). The same mediocre entertainers were onboard for two weeks, which meant the shows were terrible and featured singers that really couldn&apos;t, so we stopped going. The Hawaiian ambassadors, Tiki Dave and Leialoha were great entertainers and teachers. As well as performing every night, Dave taught ukulele; Leialoha hula and lei making. Their students performed a concert on the last sea day, which was super fun to be part of. The best and hardest working entertainers on the ship by a country mile - Tiki Dave and Leialoha, rock! The gym was interesting ... with some aggressive people and not one staff member to be seen. Witnessed a fight between a woman who took exception to the length of time someone was on the weight machine she wanted to use. I stopped going after that, preferring instead to walk the decks. The highlight of the cruise was meeting awesome people. We made wonderful friends through the ukulele lessons and we&apos;re now in regular contact. So, yes, from that perspective it was worth the price (and more). The itinerary was great and we were very luck to get hot, calm weather between LA and Honolulu. However, landing in Honolulu on Christmas day isn&apos;t ideal. Shops were only open in Waikiki, so it was overflowing with tourists. That said, it was probably our best day, due to the vibrancy. We walked around Diamond Head, swam at Waikiki Beach, shopped and had a drink and dinner on the balcony at the Hard Rock Cafe before heading back to the ship. The food was terrible. We&apos;ve cruised with Princess before, so this was no surprise. Vegetarian choice limited to one dish (often slimy eggplant), on the evening menu, so we mostly ate in the buffet. And I still don&apos;t understand why you can&apos;t get a cheese sandwich until 3:30pm! Every cake looked the same. After trying a couple, I avoided them for the rest of the cruise. Peanut butter cookies were pretty good though. If you really wanted nice food, you needed to pay $29 pp per meal to eat in the Crown Grill. Our friends raved about it but those costs added up over 16 days. With no vegetarian items on the menu, we missed out on the really good stuff. 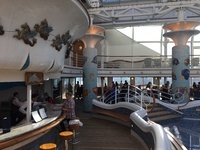 There were a lot of return guests on the ship, with many saying they wouldn&apos;t do the cruise again, due to the quality of the food and entertainment. One woman had done 42 with Princess and told them this would be her last. Most of the staff were fantastic and worked amazingly hard but we did notice a few with attitude (not in a good way). The same mediocre entertainers were onboard for two weeks, which meant the shows were terrible and featured singers that really couldn&apos;t, so we stopped going. The Hawaiian ambassadors, Tiki Dave and Leialoha were great entertainers and teachers. As well as performing every night, Dave taught ukulele; Leialoha hula and lei making. Their students performed a concert on the last sea day, which was super fun to be part of. The best and hardest working entertainers on the ship by a country mile - Tiki Dave and Leialoha, rock! The gym was interesting ... with some aggressive people and not one staff member to be seen. Witnessed a fight between a woman who took exception to the length of time someone was on the weight machine she wanted to use. I stopped going after that, preferring instead to walk the decks. The highlight of the cruise was meeting awesome people. We made wonderful friends through the ukulele lessons and we&apos;re now in regular contact. So, yes, from that perspective it was worth the price (and more). 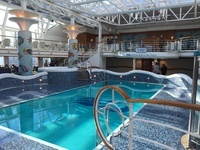 We were lucky the ship had just come out of dry dock, with new beds and large TVs installed in the staterooms. However, the curtains and headboard fabrics were grubby. I recommend you don&apos;t look closely at the duvets under the clean (and they were clean), white sheets. 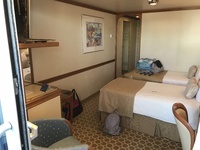 Room was cleaned regularly, with our steward working really hard all hours. We had a balcony, which we loved. The hot weather meant we could be outside a lot of the time and slept with the door open some nights. We enjoyed chatting with our neighbours on the balcony, resulting in new friendships. The boardwalk is fun. Margaritas were generous. Hawkers are annoying. Mist meant we couldn&apos;t see more than 12 inches in front of us. Disappointing.